"Selfridges has launched its ‘storytelling’ Christmas displays that draw inspiration from fairytales including Sleeping Beauty and Hansel and Gretel. The department store has decked out its iconic Oxford Street store with 25 fairytales. Around 500 contractors and Selfridges team members worked on bringing the Christmas windows to life, with more than 32,000 hours spent on its display. Selfridges has also installed a display on top of the canopy entrance to its Oxford Street store. Called ‘Destination Christmas’, the canopy installation features fairy tale symbols, such as the Golden Goose wearing a monocle and a top hat. 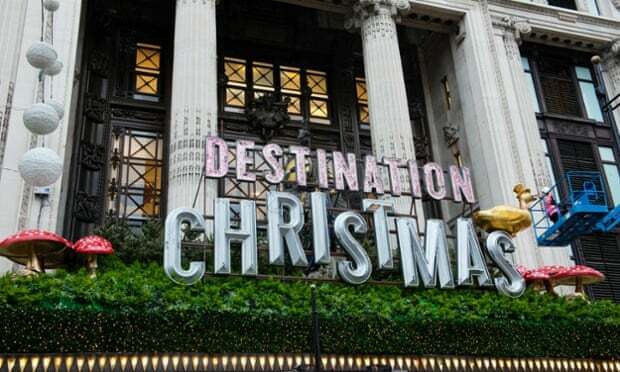 This installation weighs over two tons and features the biggest neon sign in London this Christmas, Selfridges said. The storytelling theme also extends to inside the store. Visual merchandising continues the references to literary characters and words from a Selfridges-designed Christmas story seem to fall from the sky in its atrium area. The Selfridges’ Christmas story is available to read in full and to listen to at Selfridges.com. Performers from Story Stock are also present in store to bring some of the fairytales to life through interactive storytelling and shoppers can find characters like Alice, The Mad Hatter and Peter Pan roaming the store." Every year people complain about Christmas decorations going up too early, and this display caused more controversy, as it went up in late October. Yet, according to this article from The Guardian, a third of shoppers claim to start their Christmas buying in September, and on September 3, "Christmas" was the most popular search item online. Has Christmas really started getting earlier and earlier, or do we just forget how early it started the previous year? I read somewhere that Tim Burton got the inspiration for "Nightmare Before Christmas" from seeing Halloween decorations up on one side of a store aisle and Christmas on the other, and that film was completed in 1993. That looks like a fun display. As for how early the Christmas stuff goes up, I always chalked it up to the inability for any store that is not a grocery store to market for Thanksgiving. So, they just move on to the next holiday. However, I've been looking at it in a new light lately. You see, I've just recently moved out on my own and am used to relying on all the Christmas stuff my Mom and Dad had stashed away. But now I find myself looking at wreaths for the door, pricing out artificial trees (I'm used to real ones, but artificial is handier for a bachelor like myself), ornaments, lights, gift wrap and considering starting a Christmas card list. So, starting up the Christmas selling early gives relative newbies like myself a chance to figure this stuff out and get it bought before it's all picked over. It's true, after Christmas is over each year I always tell myself, "I need to get organized and start buying gifts earlier next year!" The stresses of buying nice gifts in an already busy time of year can be a lot, so there's no harm in starting early so you can actually enjoy December when it comes. I've actually definitely noticed a difference around here, not just from people who hope to profit from Christmas sales, but everyone, since we've been having such unusually cold weather in Chicago. It's been snowing, it really feels like Christmas, so why not bust out the decorations and the Christmas tunes? But this quote from Twice Upon a Time's interview with Elise Forier Edie, talking about Krampus, the darker German folkloric Santa Claus, is perfectly appropriate for this: "The huge commercial enterprise that is Christmas in America these days is tiresome and empty. Decorations go up for sale in the stores before Halloween and the beleaguered populace is pestered to BUY! for months. I think the raw Christmas devil is a welcome relief from all the glittery crap that is today’s Christmas “celebration.” He’s raw. He’s cruel. He brings consequences to thoughtless and evil acts. He’s much, much cooler than today’s Santa." I don't get too bothered by the commercialization of Christmas myself. If it weren't Christmas, it would be some other thing. Sellers are gonna sell. That's what they do. It doesn't stop me from embracing a little hope, (this all might explain why I never quite understood the appeal of that Charlie Brown special). Well, it's true that there would be advertising either way. But Christmas is different. No other holiday gets a full two months, at least, of its own culture in terms of decorations, songs, even specialty drinks and foods. And with Christmas comes this idea that you are obligated to buy all these extra things to spruce up your home and treat all of your friends and family to gifts. Holiday movies see the ultimate villain as one who doesn't have "holiday cheer." It's just a lot of pressure, especially when the true meaning of Christmas would be better observed by donating to the poor/volunteering with charities than the middle/upper class giving each other unnecessary luxuries. Don't get me wrong, I LOVE the whole Christmas season and I do all the traditions, including gifts, but I also understand people's concerns. And even as much as I can't wait to listen to Christmas music each year, I do get a little sick of it by late December. But I don't mean to argue with the fact that you don't get upset. Constant complaining isn't very helpful or seasonally appropriate either! Stores really do just try to give people what they want, and clearly people want Christmas to be big!